Actinic keratosis is a chronic dermatological disorder, which can easily progress to invasive carcinoma of the skin. Read on to know all about this disorder, including its causes, symptoms, diagnosis and treatment. 1 What is Actinic keratosis? The condition accounts for 50% of the global population, and is usually common in fair-skinned individuals between the ages of 30 and 60 years. Males get more affected than females. The condition initially manifests as small crusty spots measuring between 2-6 millimeters in diameter that cannot be easily spotted. However, they can be felt by stroking the skin. These feel similar to rubbing sandpaper on touch. In the course of time, the skin lesions grow bigger in size. These may grow up to 3-10 mm or several centimeters, resembling warts. These dry skin patches usually appear red, dark, light, pink, or a combination of all these, with a white or yellowish scale on top. In some cases, there is no demarcation between the tiny bumps and the surrounding skin. Many patients experience excruciating pain when the enlarged lesions repeatedly collide with fingers or clothing. The skin becomes tender when multiple lesions develop within a single area, causing more discomfort and agony. Itching and burning in the affected regions are its additional features. A counterpart of solar keratosis, called actinic cheilitis, causes inflammation and cracking of the lips. The lower lip undergoes scaling and becomes rough, with blurring of the line bordering the lip and skin. In this type, the outermost layer of the epidermis consisting of dead cells, becomes hypertrophic and has a rough texture. Development of cutaneous horns, in which the skin has a horn-like projection, is its most prominent feature. The skin protrusions are remarkably thick and the base of the horn could be flat or nodular. The condition typically occurs on the scalp and back of the hands. 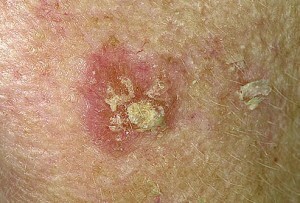 This is the heavily pigmented variant of the condition often clinically mistaken for lentigo maligna, a flat mottled, brownish malignant growth on the skin due to increased deposition of melanin. Here, the pigmentation occurs in the lower epidermis. This particular version of keratosis is characterized by circumscribed, firm, scaling plaques with rich supply of inflammatory cells beneath the skin. Therefore, the skin papules appear bright red in color. 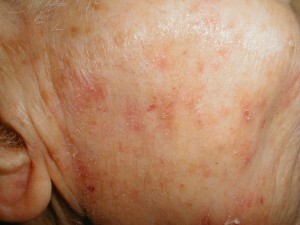 Unlike the hyperkeratotic form, the atrophic lesions formed here leads to paper-thin skin, especially in older patients. Key studies have found a correlation between senile keratosis and existence of human papillomavirus in skin. The chronic skin infection, which slowly leads to formation of tumors, has been attributed to the viral agent. In fact, Beta-papillomavirus has been discovered in patients with skin oncogenesis and UV-induced keratosis. However, medical experts are still unaware of the mechanism by which these lethal virus triggers tumor growth. It is marked by diffused thickening of the epidermal cells. It is characterized by abnormal premature keratinization within individual or groups of cells below the stratum corneum. The degree of cellular change is less pronounced and the lesions are still in the primitive stage. Although the epidermis appears thick, there is a loss of granular layer with wide gaps between the cells. In a few instances, inflammatory cells permeate the epidermal layer and exhibit actinic elastosis, in which accumulation of elastin occurs in the dermis. History of exposure to the sun is not a valid diagnostic criterion as the condition takes time to develop. However, fair-skinned patients who are into regular outdoor activities or occupations involving extended periods of sun exposure are prone to the disease. Physical observation of the skin cannot help locate the lesion, owing to the minute size of the papules. In such cases, doctors can slightly stroke, scratch or rub the affected area of the skin to palpate these localized lesions. The larger skin bumps are, however, more distinct and easier to identify. 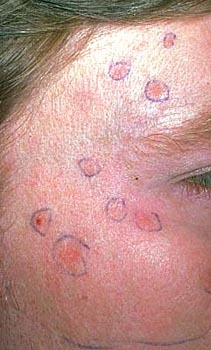 Further evaluation of the enlarged thick, scaly growths can be done with a normal skin biopsy. This is performed in order to inspect the current stage of precancerous keratosis and rule out the presence of cancer. 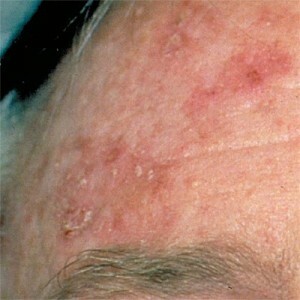 During the test, examiners usually detect these lesions on sun-exposed areas of the skin like bare scalp, face and hands. The other dermatologic manifestations such as yellowish skin and wrinkles associated with increased UV exposure can be seen alongside the lesions. The method involves application of extreme cold in the form of liquid nitrogen, solid carbon dioxide, or argon to destroy the abnormal lesions. Under freezing conditions, ice crystals form inside the tiny lumps and tear them apart. It is a chemotherapeutic cream that causes reddening and inflammation of the affected skin area prior to falling off of the lesions. Post-application, the skin appears smooth and lesion-free. The treatment procedure is, however, discomforting and the skin may remain in the inflamed state for many weeks. Thus, it must be used only in severe cases. It is a common constituent of sap in plant and a powerful inducer of cell death. Affected individuals can use gels containing 0.05% or 0.015% of the substance on trunk, upper extremities, face and scalp. Normally, it takes 2 days for the 0.05% gel to show positive results, whereas the 0.015% gel requires minimum 3 days for complete treatment of the condition. This cream is laden with a non-steroidal anti-inflammatory drug, analogous to ibuprofen. The topical medication is usually prescribed for at least 60 to 90 days. Its effect is milder than 5-FU and causes less inflammation. It is a topical medication that functions as an immune stimulator and fights against the viral agents. The first step of the clinical procedure uses an intravenous drug or dye called aminolevulinic acid for sensitizing the skin to light. After a brief incubation period, the target skin is exposed to light from a laser or other source. The photosensitizing medication gets activated and releases an oxygen molecule, which directly destroy the lesions. After the completion of treatment, patients must avoid exposure to sun or fluorescent light for two days to prevent complications. Carbon dioxide or Er:YAG lasers can repair the sun damaged skin in a short span of time. In this technique, a metal probe heated by electric current is used to excise the skin lesions. Sometimes, physicians prefer other means of surgical procedures to remove the painful lesions. There are certain herbal remedies like green tea and milk thistle that help in alleviating the painful symptoms of this condition. These herbal formulations also protect the skin from the damaging effects of UV rays. Late diagnosis as well as treatment can transform the condition into carcinoma of the squamous cells that forms the surface of the skin. 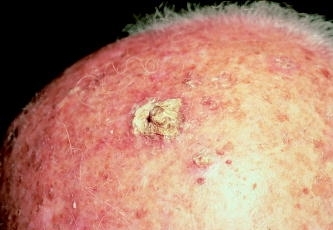 The cancer is capable of spreading to other regions of the skin. However, this seldom occurs in the case of keratotic lesions unless the tumors occupy the deeper layers. Post-treatment, patients must go for annual check-up to make sure that the problem does not recur or the minute lesions are not growing bigger. Actinic keratosis has a high rate of malignant transformation and must be immediately diagnosed if the skin spots undergo a sudden change. Healthcare professionals must educate their patients about this condition and instruct them to take the essential measures when out in the sun. Have a look at some of the pictures of Actinic Keratosis for a better understanding.